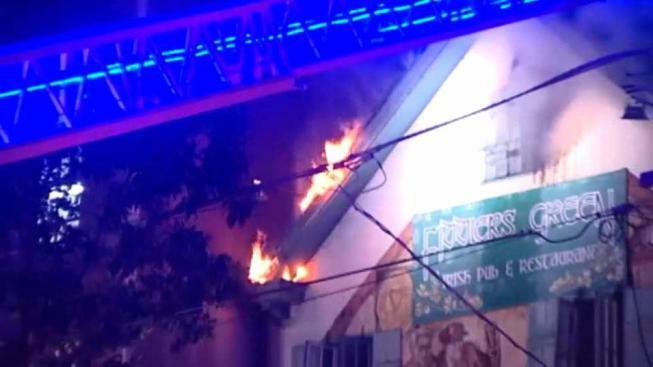 Firefighters on Tuesday managed to control a blaze that broke out at a pub inside a San Francisco building that survived the devastating 1906 earthquake. A fire ignited inside a San Francisco building that survived the devastating 1906 earthquake and damaged an Irish pub in the process, fire officials said Tuesday. The blaze broke out late Monday at Fiddler's Green located at 1333 Columbus Ave. near Fisherman's Wharf, according to fire officials. According to Brook Baker with the San Francisco Fire Department, arriving firefighters found heavy smoke and fire coming from the top floor and attic area of the three-story, wood-framed building, which houses the pub and residential units. "There is fairly extensive damage to the bar," Baker said. People in the pub were able to escape on their own, according to Baker. Four other occupants in the building were evacuated by a rescue squad. One firefighter battling the blaze did suffer a minor injury but was evaluated and released back to work, according to fire officials. The cause of the fire is under investigation, Baker said. The building that houses the pub was built in 1901, according to the Fiddler's Green website. The pub has called the building home since 1991.